After grinding out two wins on what Oats said was the team’s biggest road trip of the season, the Bulls were disappointed to see that they remained at No. 25 in the poll. “If we want to make a run in March, we can’t keep messing around and playing teams to within single digits when we are supposed to dominate them,” Oats said. 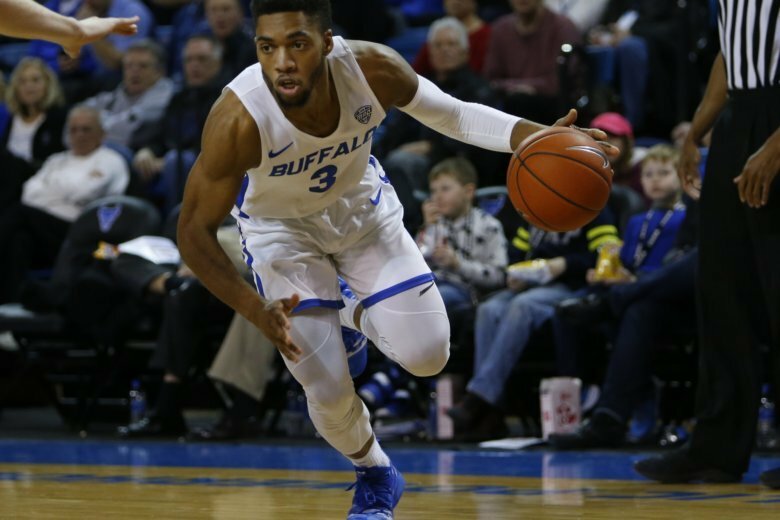 Buffalo responded to the challenge with its most dominant performance of the season on Tuesday night, overwhelming Ohio in a 114-67 rout for their 23rd straight home win. Jayvon Graves scored a career-high 26 points, CJ Massinburg added 23 and Buffalo set school records for 3-pointers made (19), points scored against a Division I opponent, and victory margin in a Mid-American Conference game. The Bulls believe blowout wins will help them rise in the national rankings and make a deep run in the NCAA Tournament. Last year, Buffalo upset fourth-seeded Arizona as a No. 13 seed before losing in the second round to Kentucky. Winning its previous two games at Akron and Toledo each by six points wasn’t good enough, according to Massinburg. The Bulls (23-3, 11-2 Mid-American Conference) opened a double-digit lead within the first 10 minutes and led 52-27 at halftime. Graves made his first six 3-point attempts to match his previous personal-best with 19 points in the first half. Freshman Jeenathan Williams set career highs with 13 points and eight rebounds and Montell McCrae had 11 points with seven rebounds for Buffalo, which won its fourth in a row and tied a school record for regular season victories set last year. Jason Carter led Ohio (11-14) with 16 points. Ohio: The Bobcats have lost six in a row to fall into the bottom of the MAC East standings at 3-10. They are 1-6 on the road in conference play. Buffalo: Oats was most impressed with the Bulls defense on their record-setting scoring night. The complete game led to their most convincing win of the season, which the Bulls hope will be noted by the NCAA tournament selection committee. Ohio coach Saul Phillips shared his opinion that Buffalo is playing for NCAA Tournament seeding now and has already done enough to merit an at-large bid should the Bulls get upset in the MAC tournament. Buffalo, which came into the game ranking seventh in the country in scoring at 84.8 points per game, shot 56.9 percent percent from the field and made 19 of 33 (57.6 percent) from beyond the arc. The Bulls’ previous scoring record against a Division I opponent was 110 points, set three times, including twice this season in victories over Dartmouth and Toledo. The old record for made 3-pointers was 18 in Feb. 22, 1996 defeat of Troy and the Bulls’ biggest MAC win before Tuesday night came in a 96-50 drubbing of Bowling Green on March 4, 2008. Winning its 23rd in a row at Alumni Arena, Buffalo matched Tennessee for the second-longest home win streak in the country. Houston has won 32 straight at home. Former Buffalo Bills quarterback and Pro Football Hall of Fame inductee Jim Kelly watched the game from a courtside seat and spoke to the Bulls in the locker room after their win. Ohio heads home from a two-game trip to play Bowling Green on Friday night. Buffalo hosts Kent State on Friday night in the second of a season-long three-game homestand.